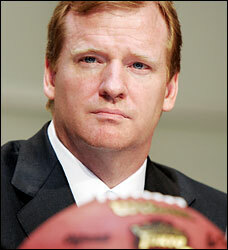 NFL Commissioner Roger Goodell is losing ground, quickly. Players, coaches and sportswriters alike are lining up to point out the fact that Goodells days as an effective leader for the National Football League are coming to an end. His recurring vendetta against the players and coaches of the New Orleans Saints has been vindictive and transparent to anyone who cares to look. Weather Goodell was trying to point out a wrong doing or simply expressing his disapproval for selected individuals, the way that he went about it was distasteful at best and at worst borders on criminal discrimination. Even after he was forced to bring in help in the form of Ex Commissioner Paul Tagliabue, Goodell continued to use every means available to cripple the Saints organization. Notice how they set the hearings in New York on the same day that the Saints were playing in Atlanta. Tagliabue was hearing vital testimony against Vilma and Smith but they could not be there because they had to be in Atlanta. Just the fact that it was so obviously set up that way had the Saints weakened and unfocused, again. Last week Former Commissioner Paul Tagliabue vacated all of the suspensions for Saints linebacker Jonathan Vilma, Defensive end Will Smith, Anthony Hargrove and Scott Fujita in a move that surprised some writers and fans. But really, what else could he have done? The case was in such a mess by the time that Tagliabue took over that is was virtually impossible to separate truth from fiction. However, Goodell said he doesn’t owe the four previously suspended players the league connected to the New Orleans Saints bounty scandal an apology. Throughout the Saints bounty program process, New Orleans quarterback Drew Brees has been an outspoken critic of the way the NFL in general, and Roger Goodell in particular, has handled the investigation. “I’m so happy for our players. … I think that this was some serious vindication. … Thank God for the fight and the resolve all those guys have for justice.” “What I’d like to see is a level of accountability on the part of the NFL and commissioner Goodell in regards to the mishandling of this entire situation”.